Looking for an easy dinner using chicken thighs and simple ingredients likely to be found in your pantry and fridge? 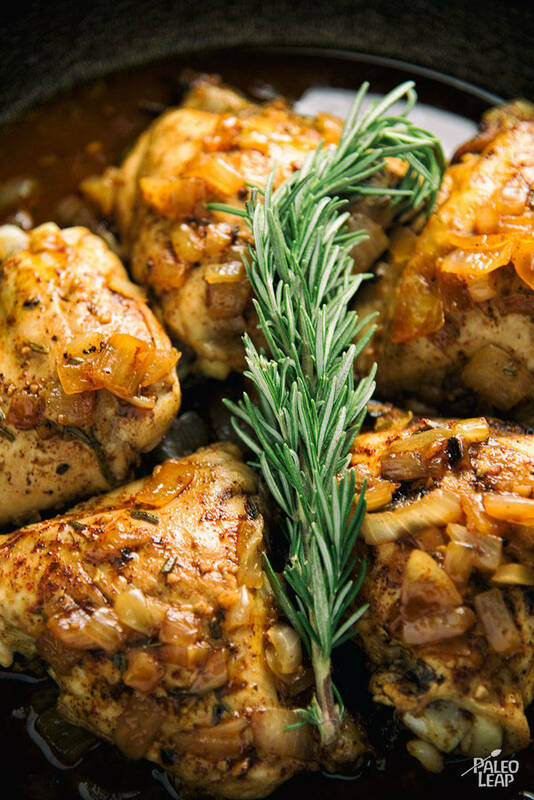 There’s no need to turn on the oven or fire up the grill with this recipe; turn on the stove-top and let the flavors of caramelized onions and rosemary do the work for you. The chili powder-honey mixture brings out warmth and sweetness as the thighs cook. Prefer not to include honey? That’s fine — the chili powder, ginger paste and lemon juice bring a spicy bite to this marinade. Try these thighs with a salad or make a celeriac mash. The creamy twist on mashed potatoes will pair well with these thighs. Use any leftover chicken in a salad or toss in a breakfast scramble. In a bowl, combine the chili powder, ginger paste, lemon juice, honey and olive oil. Season the chicken thighs to taste, and brush with the chili powder mixture. Brown the chicken thighs on both sides for 2 to 3 minutes, until skin is nice and browned. Set aside. Lower the heat to medium, add the onion and rosemary and cook for 1 minute until the onion becomes fragrant. Return the chicken to pan, skin side up, and cover. Cook 20 to 25 minutes, mixing around the the onion every 5 minutes. Once the chicken is cooked through, add the balsamic to the onions and give one last stir. Cook for another 2 to 3 minutes and serve.